The Diamond Rocks, Mourne Mountains, Co.Down, May 1997. 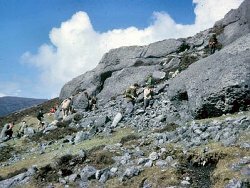 The Diamond Rocks have been a famous mineral collecting locality since the early nineteenth century when ‘Diamond Pat’ (Patrick Doran), a local commercial mineral dealer, started to trade specimens. Around 65 million years ago molten granites were migrating upwards from depth into the ancient Ordovician and Silurian sediments. There were five phases of intrusion in all, and none appears to have reached the surface at that time. As the second of these granites, a quartz-rich melt, cooled towards final crystallization, the last mobile fraction consisted of gas, vapour and fluids. The gases formed cavities called druses and, in the final stages of cooling, large crystals formed on their walls. The commonest minerals of the granite are prominent, deep brown smoky quartz crystals, feldspars and ‘books’ of dark and pearly mica (biotite and muscovite respectively). Less common and more desirable minerals are perfectly colourless and clear topazes, cloudy and clear aquamarines (a variety of beryl), fluorspar (clear to deep blue), schorl (a black variety of tourmaline), peridot (a mossy green olivine), stilbite, iron oxides and zinnwaldite. Over the last 65 million years, erosion has relentlessly stripped off the rock ‘roof’ above the granites to the point of exposure we see now. Hammering at the Diamond Rocks is unnecessary; the best specimens are found in the rock litter of the area.